The Big Idea: Rome's location and government helped it become a major power in the ancient world. The Big Idea: Rome's tripartite government and written laws helped create a stable society. The Big Idea: The later period of the Roman Republic was marked by wars of expansion and political crises. 6.3 EARLY RIVER VALLEY CIVILIZATIONS IN THE EASTERN HEMISPHERE (ca. 3500 B.C.E. – ca. 500 B.C.E. ): Complex societies and civilizations developed in the Eastern Hemisphere. Although these complex societies and civilizations have certain defining characteristics in common, each is also known for unique cultural achievements and contributions. Early human communities in the Eastern Hemisphere adapted to and modified the physical environment. Students will engage in different videos and texts to identify what the key characteristics and impacts of Ancient Rome were. How did Rome get settled? Who were some of the important leaders and people associated with Ancient Rome? What impacts does Ancient Rome still have on our world today? Do you still believe in any of Ancient Rome’s beliefs? What science, art, or technology is still noticeable in our world from Ancient Rome? How did the impacts of Ancient Roman culture influence later cultures? Are students aware of the different people, places, and interesting facts about Ancient Greece? Are students able to explain life in Ancient Rome? Are students able to compare this culture with other cultures from around the world? Students will be asked to compare the trading along the Silk Road to our “trade networks” today. How are they the same? How are they different? Students will watch https://www.youtube.com/watch?v=Yu94sFmNwMw to discuss how a Roman Road was made. Why was expansion so important to the Romans? Did we ever try to expand in our country? Compare these two ideas. How did we trade with ideas in our country? 13 Colonies, early settlements, etc. Do we still have any of these things today? Homework Tuesday, November 6, 2018: Read pages 134 -135 and answer the questions in the boxes. This will be an introduction into tomorrow’s lesson. Homework Wednesday, November 7, 2018: Read pages 137-139 and answer all questions. Have any of you ever heard of Ancient Rome before? Do any of you know where Rome is located? Have you heard of Italy? How are some things in our society impacted by Ancient Rome? Read pages 137-139 and answer all questions. Homework Thursday and Friday, November 8 and 9, 2018: ABC Chart due on Friday at the end of class. o We have already learned about many ancient civilizations. Students will have half of class on Wednesday to start looking for information and all of class on Thursday to work on this. They should take it home and finish it for homework if it is not done on Thursday in class. Students will also have the opportunity to present their project to the class if desired during the second half of class if time allows. Are students able to explain life in Ancient Rome? Are students able to compare this culture with other cultures from around the world. Students will be graded on the effort and accuracy of their ABC chart. Is it neat and organized? Is the information that you are finding from the magazine? Is the information accurate and important? Students will evaluate what they already know about the Roman Republic by filling out the GRAPES Organizer. They will put two facts in each column (you may work with a partner) and then they will use pgs.294 -299 to fill in the rest of the GRAPES organizer. Students will create a map of the Geography of Ancient Rome. They will do this by using their social studies textbook p.295 using the map of ancient Rome as a resource to help develop their maps. The teacher will explain how significant the importance of the location of Italy is by reading through pages 294-295 in the textbook as a class. The teacher will demonstrate how she wants the GRAPES organizer to be filled in. The teacher will also show an example of what the map of Ancient Rome should look like. The students will complete the GRAPES organizer for HW if not finished in class. Example first: In America we have a republic. Why is that? Critical attributes: Helps students to gain a better understanding of the text. Students will analyze (examine carefully, breaking it into components to understand it) the text on pages 296-299 as a class. They will do this by reading the text together or separately to gather information about the Republic of Rome. Students will explain why Rome’s location and government helped it to become a major power in the ancient world. They will do this by answering the question: “How did Rome’s location and government become a major power in the ancient world?” in EXTENDED RACER format. Students will then put their EXTENDED RACER format into paragraph form. And provide an image that goes along with their EXTENDED response. The teacher will explain why the government of Rome helped it to become a major power in the ancient world. Government has changed over time. Name some types of government that you know of! How do you think these forms of government have affected society? Question: What type of government do we have in the United States? How do you know? Definition of concept Analyze: examine carefully, breaking it into components to understand it. Critical attributes: analyzation helps students to grasp a better understanding of the text and squeeze out all the key important information that is being represented. Students will analyze (examine carefully, breaking it into components to understand it) the text on pages 302-307 in the social studies textbook. Students will do this by participating in reading these pages out loud as a class. I will know students have read these pages by the completion of the section 2 Roman Republic packet. Students will describe the “Roman Government”, “Written Laws Keep Order”, “The Roman Forum”. Students will do this by participating with group members and reporting on the details of one of the given sections listed above. Students will complete the section two Roman Republic packet while the other students are reporting their information about their section that they are reporting on. I will know students have gathered the information needed when the students complete section two Roman Republic packet. 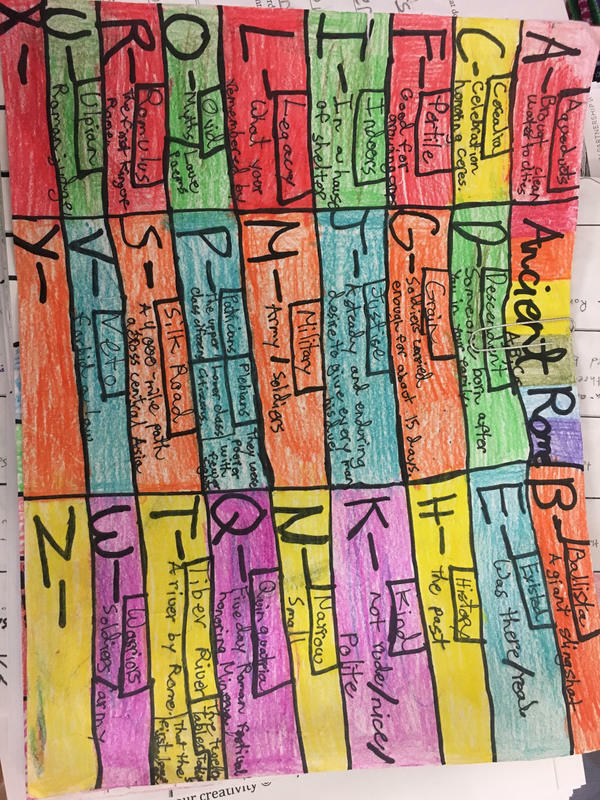 Using the textbook and Roman Republic section two packet, students will be able to explain what a tripartite government is and each responsibility of each part of government. Students will do this by reading pages 302-303 in the textbook. Students will also do this by completing the Roman Republic Section 2 packet. I will know students have done this by completing the section 2 packet. Using the textbook and Roman Republic section two packet students will identify key vocabulary words in the text. They will do this by looking up the definition of the words using the textbook. I will know students have done this by completing section 2 of Roman Republic packet. The teacher will explain how to analyze the two pages 302-307 in the social studies textbook. The teacher will explain how to fill out the section 2 Roman Republic packet. ​Homework due Tuesday: (p.326-328): “What are the accomplishments of Rome?” Students will answer answer this question in paragraph form using the RACER format. What is an example of good power? What is an example of “bad” power? The teacher will read, “Building Background” on page 308 in textbook and discuss with students. Definition of concept: Analyze: (examine carefully, breaking it into components to understand it). Students will describe the late republic of Rome by following along the teacher’s PowerPoint and taking thorough notes in their social studies textbooks. Students will explain why the later period of the Roman Republic was marked by wars, expansion, and crisis (p.308). Students will identify who Spartacus is and why he made history in Ancient Rome. They will do this by reading a biography called, “Spartacus” and completing a follow up activity attached to the article. The teacher will explain the importance of this Roman Period of the Late Republic by using a PowerPoint to explain the key concepts she would like students to take away. The teacher will explain the directions of the follow up activity of the “Spartacus” biography by showing examples of epitaphs and how students will create one for Spartacus. The students will finish their “Spartacus” biography activities. (p.326-328): “What are the accomplishments of Rome?” Students will answer answer this question in paragraph form using the RACER format. Students will analyze (examine carefully, breaking it into components to understand it) p. 330-331 in their social studies textbooks. Students will read the article, “Roman Roads” to gather more information about how the roads were made. Students will explain how the map shows, “all roads lead to Rome”. Students will evaluate how many feet are in 50,000 miles of Roman Roads. They will do this by creating a proportion. The students will finish their proportion. Homework Due : Write six facts that you can learn from the text features on pages 294-299 in our textbook. Today we will be using a new strategy called GRAPES to help us determine what we already know about the Roman Republic. The GRAPES format is an acronym that stands for Geography, Religion, Arts and Architecture, Politics, Economics, and Social Structures. Students will first determine what they know about Rome and fit their knowledge into one of each of the GRAPES categories. Then students will pair up and try to come up with a more complete picture of Rome. The goal is to have two or more facts written for each letter. The homework will be to look at the text features on pages 294 to 299 in the textbook and write down six pieces of information that you can get from the text features. Today we will be continuing to work on using our GRAPES strategy to take notes. We will take notes as a class as we read through our text, putting any information we pull from the text into a GRAPES category. For homework, students will read pages 298-299 and do a RACECE organizer for the reading check question on page 299, “What were the differences between plebeians and patricians?” Use the writing prompts suggestions found above. Homework Due Thursday, : Read pages 304-305 and do GRAPES notes. GRAPES notes involve pulling relevant facts out of the text as you read and putting it into one of the GRAPES categories (Geography, Religion, Arts and Architecture, Politics, Economics, and Social Structure). Today in class, we will be learning and practicing a new learning strategy called a Freeze Scene. In a Freeze Scene, group members have to show a concept (in this case the three different segments of the Roman Republican government) by freezing in a position demonstrating your concept. This will appear as if you paused a movie or play at an important moment. We will plan our scenes today and perform them tomorrow. For homework, students will read pages 304-305 and do GRAPES notes. GRAPES notes involve pulling relevant facts out of the text as you read and putting it into one of the GRAPES categories (Geography, Religion, Arts and Architecture, Politics, Economics, and Social Structure). Homework Due Friday, : Read pages 306-307 and do GRAPES notes. GRAPES notes involve pulling relevant facts out of the text as you read and putting it into one of the GRAPES categories (Geography, Religion, Arts and Architecture, Politics, Economics, and Social Structure). ​SS.CC.6. COMPARATIVE CLASSICAL CIVILIZATIONS IN THE EASTERN HEMISPHERE (ca. 600 B.C.E. – ca. 500 C.E. ): As complex societies and civilizations change over time, their political and economic structures evolve. A golden age may be indicated when there is an extended period of time that is peaceful, prosperous, and demonstrates great cultural achievements. Today in class we will present our Freeze Scenes (see yesterday's entry). For homework, students will read pages 306-307 and do GRAPES notes. GRAPES notes involve pulling relevant facts out of the text as you read and putting it into one of the GRAPES categories (Geography, Religion, Arts and Architecture, Politics, Economics, and Social Structure). Homework Due Monday, : Read Section 3, pages 309-313 and do GRAPES notes. GRAPES notes involve pulling relevant facts out of the text as you read and putting it into one of the GRAPES categories (Geography, Religion, Arts and Architecture, Politics, Economics, and Social Structure). ​ SS.CC.6. COMPARATIVE CLASSICAL CIVILIZATIONS IN THE EASTERN HEMISPHERE (ca. 600 B.C.E. – ca. 500 C.E. ): As complex societies and civilizations change over time, their political and economic structures evolve. A golden age may be indicated when there is an extended period of time that is peaceful, prosperous, and demonstrates great cultural achievements. Today in class we will be working on GRAPES notes in pairs on the pages we have for homework. For homework read Section 3, pages 309-313 and do GRAPES notes. GRAPES notes involve pulling relevant facts out of the text as you read and putting it into one of the GRAPES categories (Geography, Religion, Arts and Architecture, Politics, Economics, and Social Structure). Homework Due Tuesday, : Create Section 1 vocabulary cards, found on page 294. Students can write out the vocabulary on a sheet of paper if they do not have index cards. Today we will be creating timelines about the Roman Republic using the documents below. For homework, students will create vocabulary cards for Section 1, found on page 294. If students do not have index cards they can write out the vocabulary on a sheet of paper. 083Homework Due Wednesday, : Section 2 vocabulary cards found on page 302 the text book. Put the vocabulary term on one side of the card, and the definition on the other. If you do not have index cards you write out the vocabulary on paper. Begin studying for the test. See Study Guide below. Today we will be writing short biographies (4-5 paragraphs) on historical figures in the Roman Republic. Pairs and individuals will each have one historical figure to write about. We will share these bios at the end of class. For homework students will complete Section 2 vocabulary cards found on page 294 of the text book. Put the vocabulary term on one side of the card, and the definition on the other. If you do not have index cards you write out the vocabulary on paper. Homework Due Thursday, : Section 3 vocabulary cards found on page 308 of the text book. Put the vocabulary term on one side of the card, and the definition on the other. If you do not have index cards you write out the vocabulary on paper. Study for the TEST ON FRIDAY. Today we will be creating a master list of the GRAPES notes we have been working in during this chapter. Students will have some brainstorming time to find information from the chapter that pertains to each letter of GRAPES (Geography, Religion, Arts and Architecture, Politics, Economics, and Social Structure). Then we will compile a list as a class and Miss G will scribe students' information onto a master list on the SmartBoard, which students will copy down. A typed up version will also appear below after it is written in class. ​For homework students will complete Section 3 vocabulary cards found on page 308 of the text book. Put the vocabulary term on one side of the card, and the definition on the other. If you do not have index cards you write out the vocabulary on paper. Homework Due Friday, : Section 3 vocabulary cards found on page 308 of the text book. Put the vocabulary term on one side of the card, and the definition on the other. If you do not have index cards you write out the vocabulary on paper. Study for the TEST ON FRIDAY. Today we will be playing Jeopardy to study for our test on Friday about the Roman Republic. Today we will be taking a test on The Roman Republic. Chapter 10 Study Guide: Fill out this study guide and use it to prepare for the test. This is for a grade. PowerPoint Study Guide: I HIGHLY recommend that this PowerPoint is utilized to study for the test. Classwork, : Preview of Chapter 10: "The Roman Republic." In groups, students will analyze the picture on pages288-289. Then pages 290-291. In groups, decide what these photos can tell us about Rome. Together in groups, students will fill out the Seed Discussion Organizer. Homework Due Tuesday and Wednesday, : None. As a class, we will go over the Seed Discussion Organizer. We will review the meaning of standard heading or title and inferential heading or title. We will discuss whether or not the title "Geography and the Rise of Rome" is a standard heading or inferential. We will discuss the meaning of "Rise of Rome." We will analyze the photos and the text boxes together as a class. We will go over the NYS standard RI.6.2 and discuss ways to find the central idea. We will read and debate the "If YOU were there..." section in the introduction of the text. We will read the three sentences in the "Building Background" section and decide if one of those sentences might sum up the central idea well. Which sentence? We will read the section together as a class and decide if there are any other sentences or facts that can lead us to the central idea. We will begin to answer the central idea questions on the handout sheet. Questions may be answered on the sheet. Homework due : Fall of the Roman Empire, Prezi. Students will create a Prezi account. While using the iPads, students will create a Prezi that will answer the following question, "Why did the Roman Empire fall?" The answer to the question can be found in the social studies textbook on pages 339-343. Be sure to use images as well as text to explain the answer. Students should be prepared to present the Prezi to the class. The Prezi is due Friday, May 16, 2014. Homework Due Thursday, : Complete the Central Idea Questions Sheet, textbook pages 296-297. RI.6.2 Determine a central idea of a text and how it is conveyed through particular details. Review of central ideas and supporting details. "find the central idea of a text and the details that help support it." Students will think about their favorite book or movie and will think about what they would say if they had to tell a friend what the movie or book is mostly about. This is called the "central idea." "A text's central idea is the most important point the writer is trying to make. Sometimes the central idea is directly stated, but more often it's not. Supporting details are facts, examples, reasons, or descriptions that expand on the central idea. Readers determine a text's central idea and supporting details so they can better understand the text's meaning. A central idea often needs to be figured out by analyzing the supporting details. Another metaphor of a central idea is the desk being the central idea and the legs of the desk being the supporting details. As a class, we will read the paragraphs on pages 294-295 in the social studies textbook. As we read we will ask ourselves the question, "What is the central idea of the paragraph? What details support this idea?" To determine the central idea of paragraph 5 (and then for paragraph 8) we will make a list of key details. Look at the first and last sentences of the paragraph to look for clues about the central idea. However, the central idea is not always found in the first and last sentence. Based on the key supporting details, we will identify and describe the central idea by deciding what the key supporting details have in common. "Remember: The central idea is the most important point. The key supporting details support the main idea (central idea) by telling you more about it. And, the main idea (central idea) is not always the first or last sentence of a paragraph." Students will read pages 296-297 in the social studies textbook and will answer the questions about the central idea on the answer sheet. Homework Due Tuesday, : "Chapter 10, The Roman Republic" Section 1 and Section 2 Worksheet Packets. Students will work on the packet in class and for homework. Students will use their textbooks to find the answers. Students will write their answers in the packet. Homework Due Wednesday, : "Chapter 10, The Roman Republic" Section 3 Worksheet Packet. Students also have a "Sequence of Events: Social Studies Questions, pages 306-313, The Late Republic" three questions worksheet to complete in the social studies notebook. Homework Due Friday, : Complete the Central Idea Questions Sheet, textbook pages 298-299. As a class we will read about Remus and Romulus. RI.6.2 Determine a central idea of a text and how it is conveyed through particular details. As a class we will read pages 298-299. A central idea is the most important point that an author wants to make. We use the titles, headings, and first and last sentence of the paragraph to help us determine the central idea and supporting details. "Understanding the central idea of a text and being able to find supporting details will help you gain a better understanding of not just what the author is saying but why the author is saying it." Students will answer the questions on the answer sheet. DON'T FORGET THE QUESTION ON THE BACK SIDE OF THE SHEET! Homework Due Monday,: Complete the Central Idea Questions Sheet, textbook pages 302-305. Students will read pages 302-305 in the social studies textbook and answer the questions on the answer sheet. DON'T FORGET THE QUESTION ON THE BACK SIDE OF THE SHEET! Homework Due day, , 201: None. In partners, read paragraphs 1-4 on page 23. To determine the main idea, partners will make a list of three key details. Based on the key details, the partners will identify and describe the main idea by deciding what the key details have in common. "Remember: The main idea is the most important point. The key details support the main idea by telling you more about it. And, the main idea is not always the first or last sentence of a paragraph. ***AS STUDENTS ARE WRITING THEIR FINDINGS IN THEIR SOCIAL STUDIES NOTEBOOKS, STUDENTS WILL BE SURE TO BE WRITING IN COMPLETE SENTENCES RESTATING THE TASK!!!!! Homework Due Monday, : Students are expected to make revisions and additions to their Challenges of Firefighters Essay. Classwork, Friday, : Revisions to the Challenges of Firefighters Essay. Students were given back their Challenges of Firefighters Essay. If students have misplaced their Challenges of Firefighters packet, the five articles can be downloaded from the files above. Homework Due Monday, April 20, 2015: Revisions to the "Challenges of Firefighters" Essay. See the Social Studies page of this website for the five articles and more direction. There isn't any homework that is due on Tuesday, April 21, 2015. Classwork, Monday, April 20, 2015: Begin Module 3A, Writing a Newspaper Article. Homework Due Thursday, : Study Guides are due on Friday for a grade. Chapter 10 test is on Monday, May 4, 2015. Students will receive their study guide packets. Students will work on the packets in pairs. Homework Due Friday, : Complete the study guide. Due tomorrow for a grade. Students will watch two videos: one a BrainPop video and the other a Discovery Education video. As the students watch the video, students will fill out a t-chart listing the pros and cons of both videos. Students will explain why they think the videos are helpful in supporting the information we have learned in the chapter or why the video isn't as helpful. Homework Due Monday, : Study for the test on Monday. Use the study guide to study for the test. Students will complete the study guide. We will go over the answers on the study guide. We will go over the questions on the test. "Chapter 10, The Roman Republic" Test: Tuesday, May 13, 201. Students will be expected to use their social studies textbook for the test. Due Friday, May 2, 2014: PowerPoint Presentation. Be sure to email your presentation to Mrs. Looney. Be prepared to present your PowerPoint to the class on Friday, May 2. Homework Due Monday, May 5, 2014: "Chapter 10, The Roman Republic" Section 3 Worksheet Packet. Homework Due Thursday, May 8, 2014: Chapter 10 study guide. Guide may be completed in your notebook, on looseleaf, online, or in the packet. This is for a grade. See below. It is highly recommended that the chapter10.study.guide.powerpoint found above be utilized to study for the test. This resource is extremely valuable! "Chapter 10, The Roman Republic" Test: Tuesday, May 13. Chapter 10 Study Guide: Due day, , 201. Test day, , 201. Homework due Wednesday, May 14, 201: Test corrections are due at 8:00 AM, Wednesday morning, in the homework folders. You MUST explain the corrections in order to gain back half of the points that were lost. Chapter 10: PowerPoint Presentations: This project is not being assigned at this time. PowerPoint Presentation. Be sure to email your presentation to Mrs. Looney. Be prepared to present your PowerPoint to the class on Friday, May 2. Homework Due Friday, March 27, 2015: Complete the Questions Sheet for the article "The Braille System: The Language of Touch." These questions will be graded with the NYS Short Response Rubric. Each question is worth 2 points. Be sure to use the RACE Organizer. Be sure to give 2 quotes. Be sure to EXPLAIN the importance of the quote and how it relates to the question. Homework Due Wednesday, April 8, 2015: None. Homework Due Thursday, Friday, and Monday, April 9, 10, and 13, 2015: "Challenges of a Firefighter" Essay is due on loose-leaf on Monday. Essays will be about three or four pages. Each student should write an outline with bullet points. The outline should be completed by Thursday. Students will earn a grade for the outline. Write the essay following the tasks below describing the challenges of being a firefighter. Homework Due Thursday, : Complete the Questions Sheet for the article "Seeing the Needs of Others: Guide-Dog Puppy Raisers." These questions will be graded with the NYS Short Response Rubric. Each question is worth 2 points. Be sure to use the RACE Organizer. Be sure to give 2 quotes. Be sure to EXPLAIN the importance of the quote and how it relates to the question.